The Slimming World system gives you plenty to eat and no forbidden foods. This approach has enabled hundreds of thousands of members to reach their target weight. No foods are banned, there is no calorie counting and there are hundreds of 'free foods' which can be eaten in unlimited amounts. So how can it possibly work? Slimming World defines its highly successful weight-loss technique as 'food optimising', encouraging you towards a healthier style of eating for life, rather than simply for short-term weight loss. But if you ever thought this would be difficult or time-consuming, think again. In the same time it takes to heat a pre-prepared meal, Slimming World Fast Food shows you how to prepare quick, delicious meals for yourself and your family. 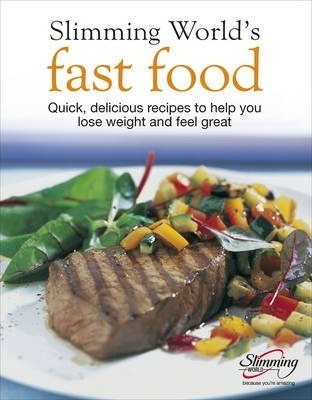 It is packed with advice and contains no less than 120 fast and effective recipes, designed to set your tastebuds tingling. Every one of these recipes takes less than 30 minutes to create, and food values are calculated for you, so you can easily make Slimming World food a part of your daily life. Here are 120 fast and delicious recipes designed to encourage a healthier style of eating for life rather than simply for short-term weight loss. Founded in 1969 by Margaret Miles-Bramwell, Slimming World is the UK's largest and most advanced slimming organisation. Each week they run more than 9,500 groups (in England, Scotland, Wales, Northern Ireland and the Republic of Ireland) via a network of more than 3,500 Slimming World trained Consultants. Nearly half a million members attend Slimming World each week.